This year, I took it upon myself to whip up my very own, homemade donuts. For some reason, frying always intimidated me but boy was I wrong! These are one of the easiest and most delicious desserts I have ever made. Warm up the milk until it’s a little bit more than luke warm, sprinkle in the yeast and one tablespoon of sugar. Stir the milk and set aside to activate. In a large mixing bowl (or in your standing mixer bowl) add your flour, sugar, salt and vanilla extract. Once the yeast is ready (foaming bubbles on top), add it to the flour mixture along with the butter and eggs. Mix thoroughly until all ingredients come together to form a dough. Now that your dough is ready, flour your counter so that it does not stick. Roll out the dough to be about 1/2 inch thick and cut out your donuts using a 3” biscuit cutter or a jar lid. Place the donuts on a baking dish, about 2 inches apart from each other and cover with a kitchen towel. Place the baking sheet somewhere warm (I put mine in my oven) and wait 2 hours for the donuts to rise. In a large pot, preheat your vegetable oil to 350 degrees. Once the oil is ready, gently place 3 donuts into the pot. Fry until golden brown on each side, about 1.5 minutes on each side. Once they’re finished, drain them on a paper towel lined plate and dip them in granulated sugar. 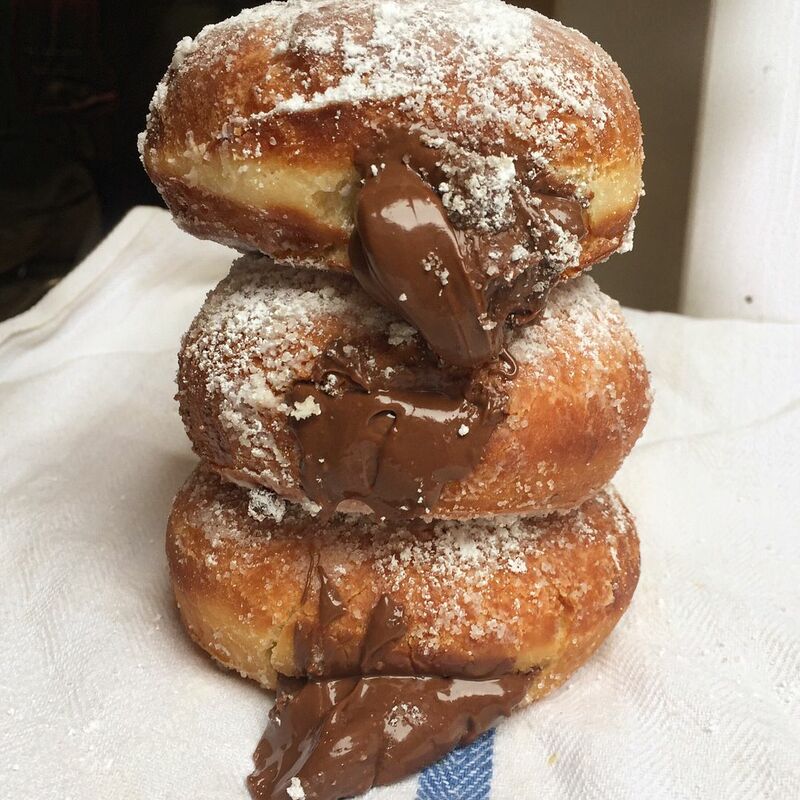 Once fully cooled, slice a small hole on the side of the donut, about an inch big and use a Ziploc bag or piping bag to fill with Nutella. Dredge the finished donuts in powdered sugar and try to enjoy them while they’re still warm!